So it’s meat-free week at my house and I’m super excited about it. I’m a veggie and carb lover and going without meat a time or two is a breeze for me. I can’t say the same for Chief but I’ve silently been trying to convert Chief at least as far as pescetarian-ism but he’s not trying to hear any of that nonsense. He wants his chicken AND his beef with an occasional serving of pork. Fine by me but this week, none of that is allowed. Last night, to kick off meat-free week, I wanted to make sure that he was satisfied. 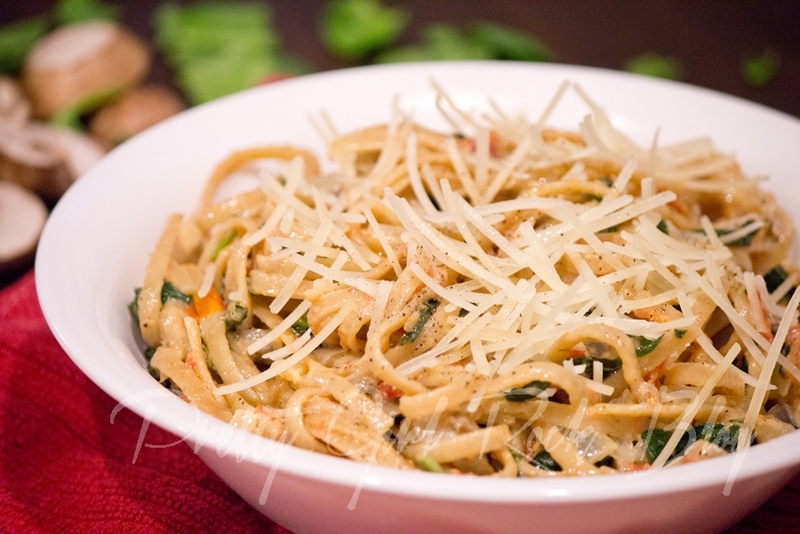 Great taste and a full belly is really all he requires and this Linguini Pasta with Creamy Parmesan Sauce really delivered; both he and MJ(the pickiest of us all) loved it. 1. Boil water & cook the pasta until al dente. 2. Heat the olive oil & butter in a large skillet over medium low heat and add garlic & onions. Saute until onions have softened. 3. Add in the mushrooms and tomatoes and let simmer for 5 minutes while stirring. 4. Stir in the heavy cream & parmesan and add salt and pepper to taste. 5. 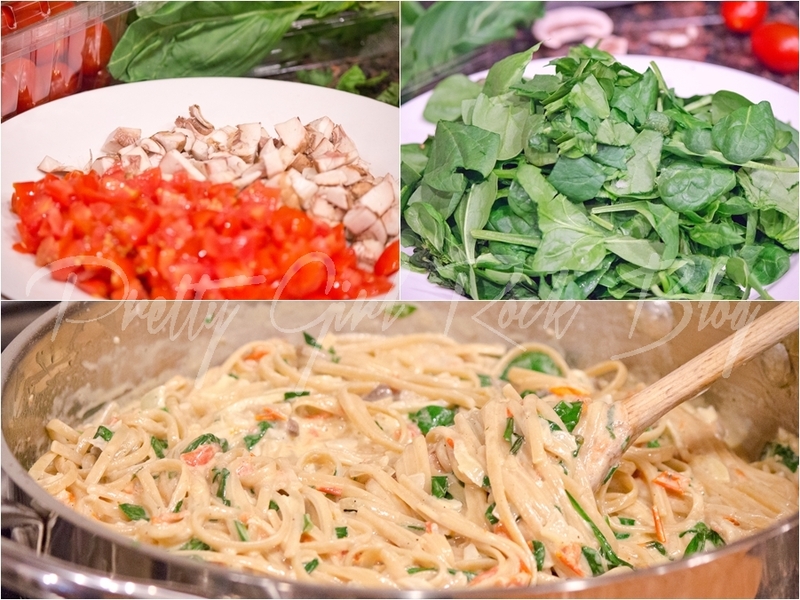 When the linguini has cooked until al dente, drain the pasta and then immediately add it to the skillet along with the basil & spinach. Continue to simmer and toss ingredients for about 2 to 3 minutes until the basil & spinach begin to wilt and sauce begins to thicken. 6. Remove from heat & serve with a little extra parm on top. A Note from PrettyChef: I’m one of those people who don’t measure when they cook as cooking is something that you feel. For all my recipes, I work with spices and ingredients that I’m very familiar with so that I can always achieve the texture, taste, color & smell that I’m looking for as the end result. With that said, all measurements provided in the recipes on this blog are approximate.